9. Gallbladder, 10–11. Right and left lobes of liver. 12. Spleen. 13. Esophagus. 14. Stomach. 15. Pancreas: 16. Accessory pancreatic duct, 17. Pancreatic duct. 21–22. Right and left kidneys. 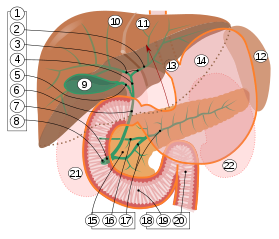 The front border of the liver has been lifted up (brown arrow). Intrahepatic bile ducts compose the outflow system of exocrine bile product from the liver. Lobar ducts (right and left hepatic ducts) - stratified columnar epithelium. Interlobar ducts (between the main hepatic ducts and the interlobular ducts) - pseudostratified columnar epithelium. Interlobular bile ducts (between the interlobar ducts and the lobules) - simple columnar epithelium. Abdominal ultrasonography (with Doppler) of dilated intrahepatic bile ducts, in this case because of pancreatic cancer. The bile ducts are colorless (black) in contrast to blood vessels (portal vein near center, and hepatic artery to the right of it) which have Doppler signal. ^ Standring S, Borley NR, eds. (2008). Gray's anatomy : the anatomical basis of clinical practice. Brown JL, Moore LA (40th ed.). London: Churchill Livingstone. pp. 1163, 1177, 1185–6. ISBN 978-0-8089-2371-8. ^ Roderick N. M. MacSween; Alastair D. Burt; Bernard Portmann; Linda D. Ferrell (2007). MacSween's pathology of the liver. Elsevier Health Sciences. pp. 518–. ISBN 978-0-443-10012-3. Retrieved 27 June 2010. This human digestive system article is a stub. You can help Wikipedia by expanding it.